The story, involving young King Louis XIV and his imprisoned identical twin brother, is one of Dumas’s greatest tales, exceeded only by The Count of Monte Cristo and The Three Musketeers itself. 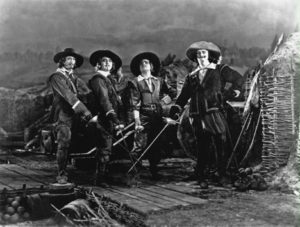 Fairbanks, who wrote the screenplay, wisely tacked on an extended prologue set back when the Inseparables were all still musketeers to remind the audience of their characters and camaraderie. This adds some jolly roistering to what is otherwise a relatively somber story, and incorporates elements from the latter half of the first novel that didn’t appear in the 1921 adaptation. The second half of The Iron Mask is more faithful to the spirit of Dumas’s novel than it is to the details of its plot, but even to this Dumas fanboy, Fairbanks’s deviations make sense from the cinematic standpoint. We still get secret passages, a dark conspiracy to replace King Louis XIV, and his ultimate salvation thanks to d’Artagnan’s courage and unswerving loyalty. The pacing of the film never flags or falters, the acting is consistently solid, and it’s gorgeous to look at. As noted in the opening credits, “This entire production was under the supervision of Maurice Leloir,” the veteran French artist who was the most celebrated of the many illustrators of The Three Musketeers, and an expert on the period. The costumes and sets, therefore, are visually sumptuous and historically impeccable. A fine production in every way. Watch for Nigel de Brulier reprising his rôle as the domineering Cardinal Richlelieu, and totally nailing it.